For those in the know, Under the Moons of Mars was the original title of Edgar Rice Burroughs’ first John Carter novel, which was subsequently retitled A Princess of Mars. With that one story, of dead Mars and the most beautiful woman in two worlds – a princess that just can’t seem to stay out of trouble, the author forever changed science fiction and the dreams of generations of teenaged males looking for adventure. Suddenly, in one sword stroke, Earth was no longer enough to capture the attention of readers that are about to get an infusion of new blood in March when John Carter hits the big screens. A Princess of Mars was first published in 1912. Now, a 100 years later, the rights to the character and to those stories has fallen into public domain. Other writers can lift up the swords of Mars and sally forth to poke about in dead cities and challenge fierce opponents. John Joseph Adams, who is now one of my favorite anthology editors, has a book coming out that deals with John Carter, Dejah Thoris, Tars Tarkas, and Mars in all its savage glory. My favorite of the bunch, and the first in the collection, is Joe Lansdale’s “The Metal Men of Mars.” Out of all the stories in this book, this is the one that is truest not only to John Carter and Mars, but to the unique and unpolished writing style of Edgar Rice Burroughs. I hadn’t heard of David Barr Kirtley before, but he’s hit my radar now with “Three Deaths.” His story of one of the Tharks first defeated by John Carter shortly after his advent on the Red Planet touched my heart in ways that I just hadn’t expected. Truly awesome stuff and instantly more vulnerable than anything Burroughs had ever written. 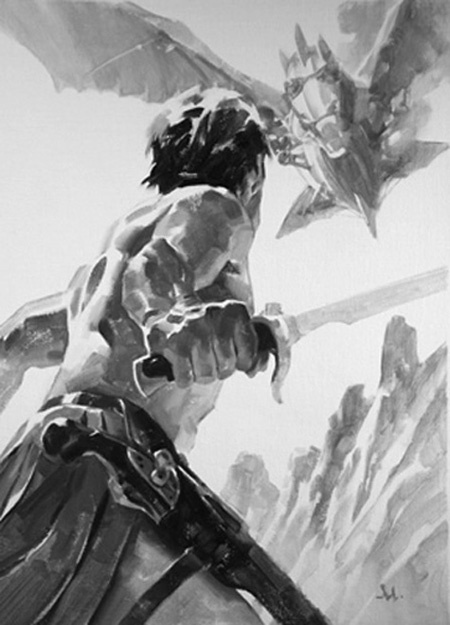 Peter S. Beagle’s “The Ape-Man of Mars” was diverting and kind of a cool juxtaposition of Tarzan and John Carter’s backgrounds played against the history they had come from, but I ended up wanting more than was offered. “A Tinker of Warhoon” by Tobias S. Buckell was interesting and offered a different view of the Tharks and their mortal enemies, the Warhoon. Everyone who has read the Mars books remembers Sarkojah, the evil female Thark who tried to get Dejah Thoris and Sola killed. Robin Wasserman tells the rest of her story in “Vengeance of Mars,” and I enjoyed it quite a lot. Austin Grossman’s “The River Gods of Mars,” started out really cool and there was a neat idea to involve real world space exploration in the Mars mythos, but I didn’t much care for how it played out at the end. Promised really cool adventure and didn’t quite get there. “The Bronze Man of Mars” might have been a tip of the hat to Doc Savage, but I’m not certain. L. E. Modesitt, Jr. delivers a solid story of derring-do here. To me, Genevieve Valentine’s “A Game of Mars” felt a little rushed, but that may have been because she was folding in so much history and emotion lifted from the old stories that were given new life in this one. I think I’d like to see more of Tara of Helium’s story after the events relayed in The Chessmen of Mars. Garth Nix’s “Sidekick of Mars” was entertaining but felt truncated. A lot was missing, it seemed, but I liked the first person character he created well enough. To those who remember, Chris Claremont basically finished out the John Carter, Warlord of Mars run at Marvel Comics after Marv Wolfman left the strip. The comics were solid, but his story, “The Ghost of the Superstition Mountains” left me cold. I had too many problems with John Carter, Dejah Thoris, and Tars Tarkas being on Earth. Gravity alone would have made this impossible, not to mention the heavy oxygen saturation that would have kept the two native Martians higher than kites. Throw in Cochise (why?) and a plot that doesn’t really get resolution, and I was confused. This is even listed as Chapter 11. S. M. Stirling’s “The Jasoom Project” is a return to adventure and is the story of John Carter’s great-grandson. It smacks unerringly of a John Carter story and has lots of Martian history woven into it, as well as a nod to Tarzan and Pellucidar. Finishing out the collection, Jonathan Maberry’s “The Death Song of Dwar Guntha” really hit the spot for a final goodbye to Mars – at least for the moment. The tale is about two warriors at the ends of their days, and the final fight that stretches before them. Awesome little story. This collection was a great delight to me, the illustrations really set it off, and I hope that Adams manages to find a publisher interested in doing a sequel. I’d love to read it. This entry was posted on January 17, 2012 at 5:35 am and filed under Adventure,Anthology,Classic SF,Illustrated,Juvenile,Short Stories,Young Adult. You can follow any responses to this entry through the RSS feed. You can leave a response, or trackback from your own site.